Cedar Fork Stitches: A First, A Finish and a GIVEAWAY! A First, A Finish and a GIVEAWAY! Since before Cheryl Brickey's Meadow Mist Designs amazingly generous, and timely Pattern Writing Blog Series, I have had this to do! I am excited to finally have this accomplishment under my belt! With notebooks full of designs, I was determined to push to get this one done. While I would have loved to have had this ready months ago, a cross country move in March and raging wildfires in July are my excuse for a September wrap up and release! I have reopened my Etsy shop, Cedar Fork Stitches, where this pattern is available for sale! Tumble Bug is a precut friendly design suitable for beginners with basic sewing and cutting skills. I have included instructions for 2 quilt sizes: Baby, 32"x 32" and Throw size, 72"x 72". 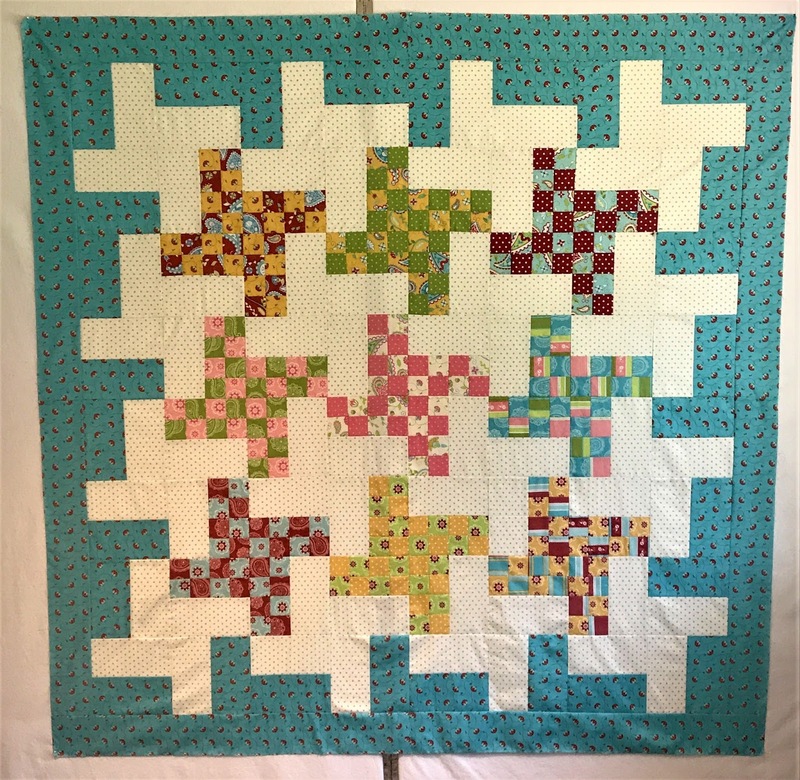 It is a fun quilt that comes together quickly using a couple time-saving piecing techniques! 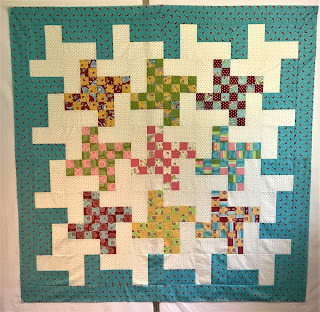 The baby quilt uses 2 mini-charm packs. I used Bread and Butter by American Jane(Moda). The Throw size uses two 5" charm packs. It was such a pleasure using Grand Canal by Kate Spain(Moda) paired with this Robert Kaufman Washed Light Indigo Chambray! I am indebted to my proof readers and pattern testers who answered my call on Instagram, and who taught me how indispensable proof readers and pattern testers are! I so appreciate their time and talents! Shannon (@auntiemontana on IG) made this darling version of Tumble Bug using Caravan. Bonus? She lives in, you guessed it, Montana! That makes us practically neighbors! Emma (@hillstitches on IG) was also kind enough to actually make the quilt! She made time for this even though she is right in the midst of starting her own online fabric shop, Hill Stitches! Check out Tumble Bug, done up in Lizzy House fabrics! Emma also contributed suggestions that made the final pattern BETTER! Sandra (@sewofcourse on IG) brought her A-game to the proof reading table, for which I am ever grateful! Maybe we will see her version in a future Finish A-Long?! To celebrate my first pattern, and my first magazine feature, the excitement of which was rather "consumed" by the fire happenings, I have a bundle of goodies to giveaway here to one US resident! If you live outside the US, please jump over to my Instagram for a chance to win a PDF copy of Tumble Bug! Tumble Bug! A PDF copy! If you are a US resident, simply leave a comment below to enter this giveaway! If you live outside the US, jump over to my Instagram @cedarforksarah, for a chance to win a PDF copy of Tumble Bug! If you like, tell me what you have enjoyed most about this Summer, in spite of the myriad hardships that have abounded lately! The giveaway will close midnight MST on Sunday, September 17th. I will draw a name from among the entries out of my son's new custom hat Monday, September 18th! And MANY thanks to each of you for your kind and enthusiastic participation and support! I very much appreciate it!!! Congrats on your first pdf. It is an awesom,e anxious moment isn't it! One learns so much from doing this. Cute pattern and a great giveaway. I love your son wrapped up in Tumble Bug! It gives great perspective on the large size. Congratulations on your first pattern and the publishing in Quick Quilts. Well done on these designs! Here's to many more to come! Congratulations Sarah!! Releasing the first pattern is so scary but exhilarating at the same time. It's a fun design, and I know there will be many more! YAY for you!! I know just how hard it is to write patterns...its tedious, time consuming and just not natural for me! It's easier to push a pattern design to the back burner. It's a beautiful design and your quilts are beautiful. It is amazing how many people are happy to help out with testing...thank goodness! Congrats and I'm so proud of you!! Woot woot! Congrats on your first pattern and on the publication too! So glad you kept plugging away despite life getting in the way. And yes, aren't pattern testers/proofreaders the best? Darling quilt! I love the way you used traditional 9-patches in a fresh, modern way. Congratulations! Good job it's such a cute quilt. Hope you are all safe and out of harm's way ay from the fires. What I enjoyed most about this summer was going with my husband on a couple of trips, one to San Diego, and the other was a driving trip through Kansas, Colorado, Wyoming, South Dakota and Iowa to see the mountains and Yellowstone. Being a farmer it is sometimes hard to get him to get away and travel. I love your quilt and want to congratulate you on your wonderful accomplishment! Congrats on the PDFs. Publishing is a scary thing isn't it? My favorite memory from this summer is seeing the total eclipse. My family and I went to a park and celebrated with thousands of others. It was a lot of fun. Wonderful job Sarah. I feel like I don't pay attention to detail enough to write a pattern. I am filled with admiration for those, like you, who can do this. Congratulations! I hope you are wildly successful and that you are already starting to think about the second pattern! Tumble Bug is a winner, for sure! Such diversity among the finishes and I love them all! Funny you mentioned Montana because our vacation to this beautiful state in June was the highlight of our summer. We rode the Amtrak from Wisconsin to Glacier National Park and spent a week there. It was glorious and so different than any place we've ever been. I've never used any Jen Kingwell fabric and those charms are adorable! Would love the chance to play with them. Congrats on your first pattern! What a cute quilt top! Kudos to all your accomplishments. Wonderful pattern. I set aside some gray and pastel fabrics a few weeks ago for a to-be-determined quilt. Could this be it? Congrats on the pattern! I am in awe of anyone who can explain how to make a quilt! What a fun quilt pattern you've created. It's interesting to see it in so many colors, which helps the imagination "see" other possibilities. I enjoyed our beach vacation in July. Much of my summer was spent worrying about my mother who had a rough time with several health issues, so the week at the beach was a great stress reliever. Love your pattern and admire the flexibility to make it look different. Thanks for the drawing. I loved your pattern as soon as I saw it. There are so many fabric possibilities swimming in my head. I was just in Montana for the first time, visiting Yellowstone National Park and I fell in love with the big sky. We plan on visiting again soon. This is such a cute pattern! Congratulations. The fires are so terrible. And not all out even now. Amazing that you got the pattern done with all of that. Great work, fun design. It's a great pattern and even better when you see it created full size. Congratulations on the pattern and the recognition from McCall's. Congrats on your pattern Sarah!! Congrats on the pattern! I love the use of charms!